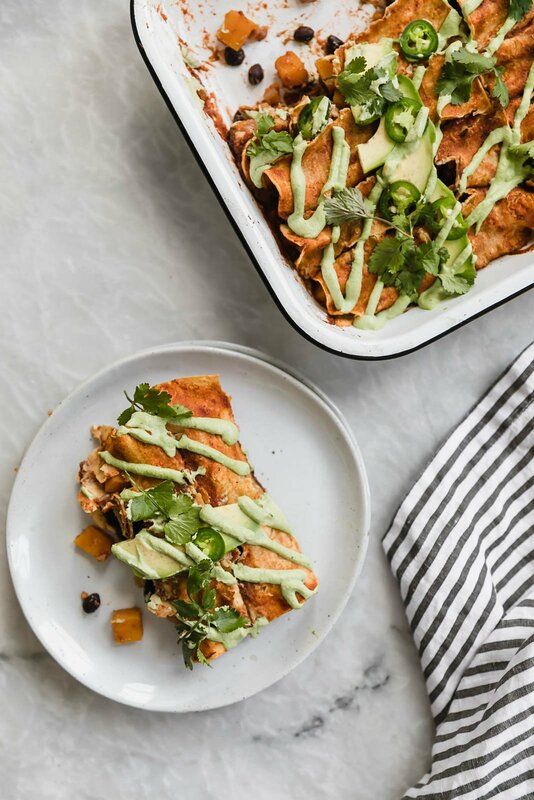 So let’s kick off 2018 with a recipe I’ve been obsessed with: vegan and gluten free black bean and butternut squash enchiladas with a spicy jalapeño cashew crema. I get that the title is a little absurd and long but hey, I had to convince you to make them with more than just a few words. You know I consider myself the queen of the enchies. Or the enchiladas. Homemade enchilada sauce: This is my FAVORITE enchilada sauce because it’s SO easy to make. I made a variation of it for this recipe, but if you prefer you can use 1 (28 ounce) of your favorite enchilada sauce as a sub. 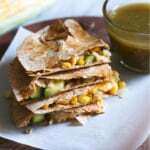 Corn tortillas: I like to use gluten free corn tortillas. If they are hard to roll for you, try wrapping them in wet paper towels and microwaving them for 20-30 seconds to soften so that they are perfect for rolling. The veggie filling: I love the butternut squash and black beans filling mixed with the enchilada sauce. 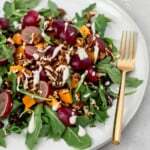 You could also use regular potatoes or sweet potatoes as your filling. Cashew crema: I know this jalapeno cashew crema sounds crazy and all, but IT IS MAGICAL, fresh and so so flavorful. It tastes like creamy jalapeno nacho cheese. Basically, you need to make them ASAP because you’re going to loveeeee them. They’re perfect for dinner parties, date night, or meal prep. Have a happy healthy week, loves! xoxo. Preheat oven to 350 degrees F. Spray 9x13 inch baking pan with nonstick cooking spray. Place ½ cup cashews in a large bowl, then add 2 cups boiling water and let the cashews soak in the hot water for approximately 45 minutes-1 hour while you prepare your enchiladas. Alternatively you can soak your cashews overnight in room temperature water so they are already ready to go for the cashew crema. Make your enchilada sauce by adding the enchilada sauce ingredients to a large bowl: tomato sauce, tomato paste, water, apple cider vinegar, garlic, chili powder, cumin, oregano, cayenne pepper and salt. Mix well to combine. Heat olive oil over medium heat in large skillet. Add garlic and diced onions and saute until garlic becomes fragrant (about 30 seconds). Next add in cubed butternut squash, chilli powder, cumin and salt; then stir and cover for about 8 minutes or until fork tender, stirring occasionally to ensure squash doesn't burn. Add a few teaspoons of water to the pan if necessary to help the squash cook. Once squash is fork tender, transfer to large bowl and add in black beans and 1 cup of the prepared enchilada sauce; stir to combine. To assemble enchiladas: Add about 2/3 cup enchilada sauce to bottom of the 9x13 inch pan and spread around. Warm tortillas in microwave for 20-30 seconds wrapped in a wet paper towel so that they are easier to roll up. Add about 1/3 cup of the butternut squash & black bean filling to each tortilla. Roll each tortilla up and place seam side down in baking pan. Pour remaining enchilada sauce over the top. Bake for 25-30 minutes. 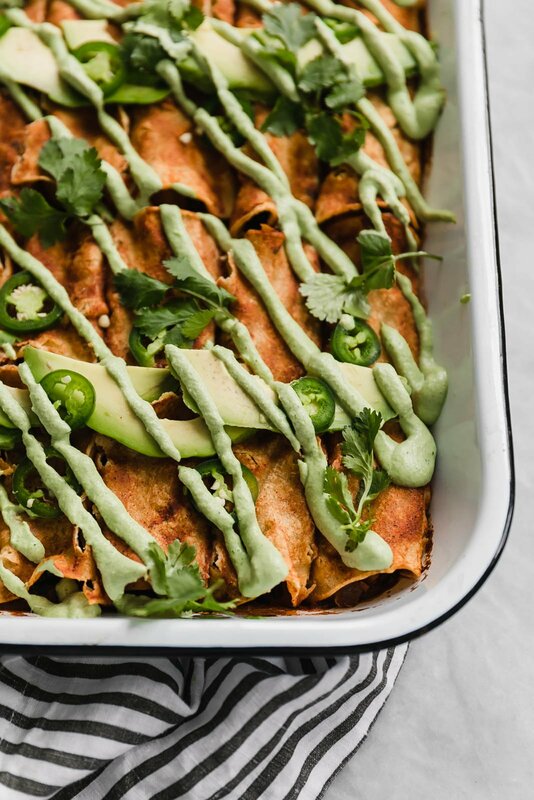 While the enchiladas are baking, you can make the cashew crema: Add drained cashews, garlic, jalapeno, cilantro, water and salt to a high powered blender. Blend until a thick sauce comes together, adding a tablespoon or two more of water, if necessary. Add cashew sauce to a ziploc bag and snip off a corner, then squeeze sauce all over the enchiladas. 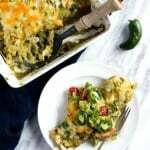 Serves 6, 2 enchiladas each. 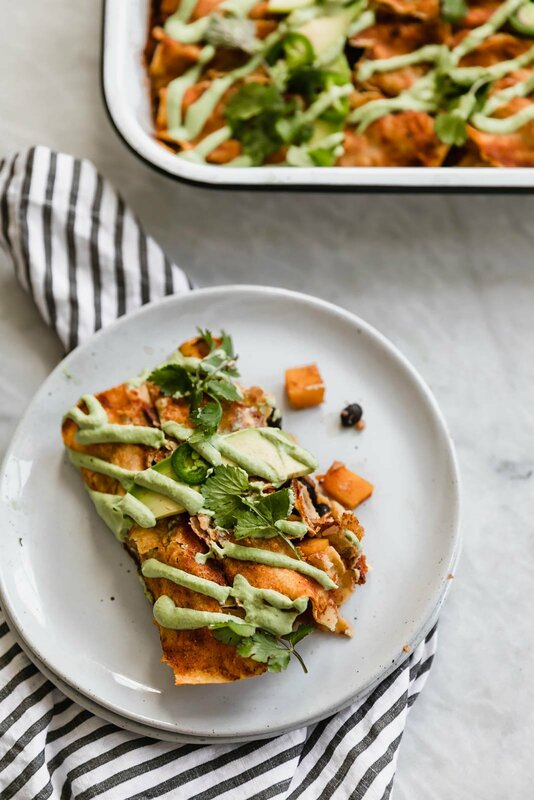 40 Responses to "Vegan Butternut Squash Black Bean Enchiladas with Jalapeño Cashew Crema"
I have some of your enchilada sauce in the freezer, so this recipe is going on my must make list for the weekend! This sounds incredible!!!! Totally making a double batch and sticking it in the freezer! thank you!!! 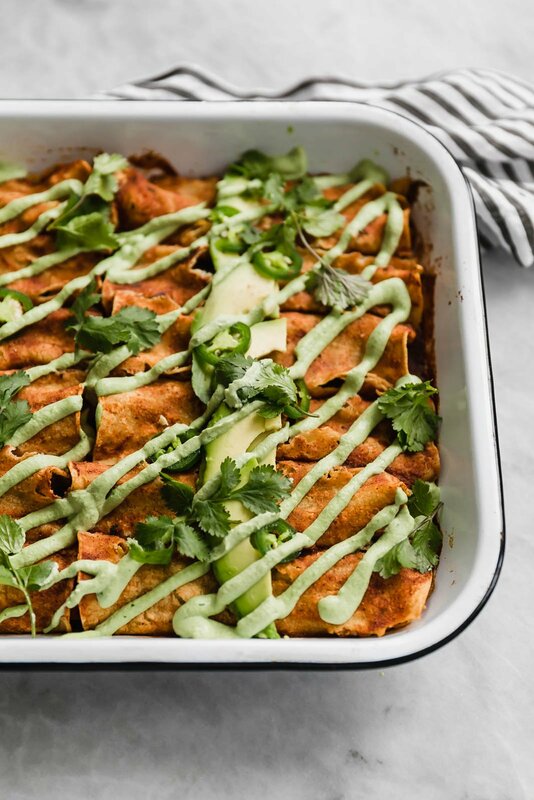 I have always loved making my own enchiladas at home because they are gluten free. We tried our sweet potato black beans and maybe it was just the potato consistency I wasn’t a huge fan, but can’t wait to try out these butternut squash ones. Thank you so much for the tip on rolling corn tortillas, it’s life saving! What brand of tortillas do u use that r gluten free? I like to use regular corn tortillas, which are naturally gluten-free! Enchiladas are TO DIE FOR. 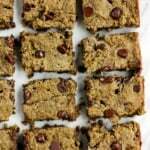 I love that these are vegan too–never tried making them myself, however. Might have to get on with that! AGREED. The best! Hope you try these ones out! My corn tortillas all split even though I got them quite moist prior to rolling. It was hard to scoop them out when they were in so many pieces. The taste was pretty good but it was such a messy presentation. If I make them again I’ll use flour tortillas. It looks so good~~ Wow!! Thank you for sharing the recipe! Love that this is vegan! You bet! Perfect vegan meal!! I made these tonight with your salsa verde recipe (minus the greek yogurt) instead and they were the absolute bomb. The exact flavor profile I was hoping for, can’t wait to add this recipe to the rotation, thanks! Delicious! I’m going to have to try these with salsa verde next time – YUM! I made a batch of these for tonight but will definitely have leftovers (2 person household). Do they freeze well? How do you recommend re-heating them after freezing if so? They do! To re-heat you can thaw and then bake them or bake from frozen (the second option will just take a bit longer). Hi! I know you said these freeze well… but will they get mushy in the fridge? I’d have to microwave them to reheat. I want to prep them to bring to work, where all we have is a microwave. Thanks! I made this for dinner a few nights ago because on a whim I bought a butternut squash without ever cooking with one before. As I’m cutting the squash I was asking myself “is this really worth it? !” because squash is so hard to cut but let me tell you, SOO worth it! 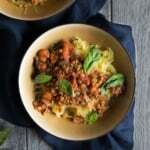 The squash was so tender, delicious and everything about this recipe was just spectacular. My boyfriend and I both LOVED it. Though my crema came out a little thicker than I wanted (probably due to my low power food processor), I spread it on and it was delicious. But I’d love to be able to drizzle it on next time so I can get a good picture. Any recommendation on how to make the crema runnier without it diluting the flavor? Thanks for much for this recipe, it’s a keeper! So happy you both loved these! 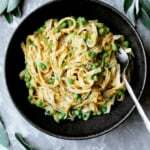 One of my absolute fav recipes (and totally worth cutting up the butternut squash). I would add some more water about a tablespoon at a time – the flavor shouldn’t dilute too much! Amazing!! Glad the whole family loved these 🙂 That crema truly makes the dish! Can these be made a day ahead ? The enchiladas came out delicious! However, I struggled with the cashew crema. 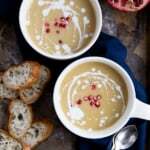 I followed the recipe exactly as you listed and put all ingredients in a Vitamix, but could not get the ingredients to blend into a thick and creamy consistency. Any advice on what to do next time? I’d suggest adding some more water so that it blends up well! You might just have to adjust/add more of the seasonings as well, but feel free to taste as you go. I tried this tonight. My husband and I really liked it. I usually stick to very simple meals, and this looked a little intimidating. I’m so glad we tried it. I was very hesitant to add the Crema. It was the perfect touch. Thank you for sharing. I’m glad you gave this one a try! It’s easier than it looks 🙂 so happy you both liked them! There were absolutely delicious! We are a “saucy” and “seasoning” family so I doubled the crema and enchilada sauce. I also added much more garlic, cumin, and oregano than this calls for. Tasted amazing. This recipe has been added to our list of dinner ideas. So delish! A great meal to prep ahead of time…we are 2 people so we only baked half and have the rest in the freezer. Healthy yummy and filling….thank you! 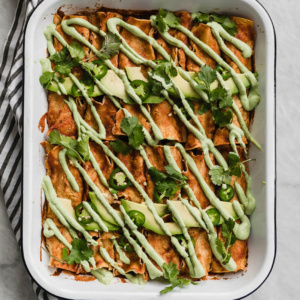 You are the enchilada queen. I totally come to your site whenever I want an enchilada recipe. The sauce is always the hardest part for me to get right. I was out of chili powder so I used all paprika (which is how my Mexican mother used to make the enchilada sauce growing up). I also opted for the avocado yogurt sauce from your other black bean and butternut squash recipe. I added some cabbage and radishes on top for some extra veggies and YUM. So happy to hear that Melanie! 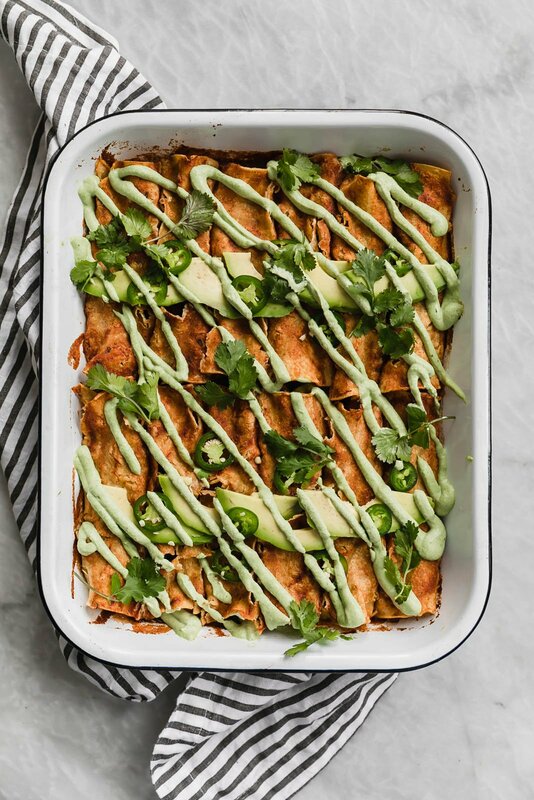 Enchiladas are one of my specialties 😉 Love that you mixed and matched the sauces – that avocado yogurt one is too good.